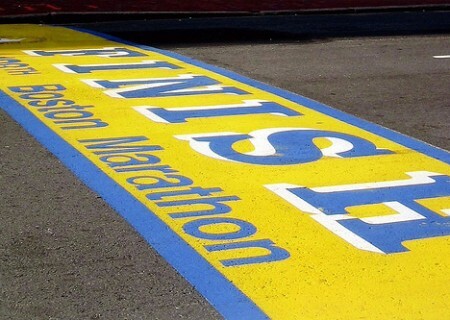 Adventure Foot is so happy to share a race report from Cindy Spake, who just ran for the first time in the Boston Marathon. You may have heard in the news last week, but this Boston event was one of the hottest on record and has earned the nickname, “Boston Baked 2012.” Cindy had a great showing at the event despite the heat, and her race report gives you a great idea of how the event looked at ground level. Huge congratulations to Cindy for this milestone accomplishment! 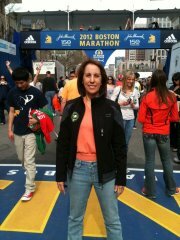 On April 16th, 2012, I participated in the 116th Boston Marathon. The marathon has been renamed the “baked”marathon due to the 87-90 degree heat that the runners had to negotiate through the 26.2 historic course. 3800 participants did not even pick up their numbers which is typical to have no shows for various reasons. 427/22853 participants chose the option to defer to next year’s race that was offered by the Boston Athletic Association (BAA). Finally, over 940 participants who started the event were unable to complete it and 152 went to the hospital according to Boston news reports. We headed back to our hotel, got the car and went to an Italian neighborhood to enjoy a great meal at Marios. The neighborhood was so much like The Hill in St. Louis. I certainly was not disappointed with the quality meal and homey atmosphere. I slept really well that evening. The day before the race began with a long morning sleep in. We went to an afternoon ballgame at Fenway Park which the Red Sox won against Tampa, had an early evening meal after and achieved our goal to get back to the hotel early. It was a beautiful day to spend with my family and to celebrate my son’s 18th birthday. Boston is an American treasure. If you get an opportunity, check it out! The sites and pubs are extraordinary. We did some more sightseeing after the marathon. It took a while for me to fall asleep but I think I got 5-6 hours of quality sleep before I woke at 5:00 to ready myself for the journey on the train system into the city towards a place called The Boston Commons. My DSH accompanied me to this destination. The buses were lined up around this green, park-like setting and there were over 15,000 runners who passed through this area to get to the start line. I was grateful to use the portapotties there because the ride took nearly an hour and 15 minutes. I said my goodbyes to my DSH with the promise to survive and race smart. I could see the look of deep concern in his beautiful green eyes which made my eyes swell with tears as he turned and walked away. I was reminded of how truly devoted we are to one another and how preparing for a marathon affects the family like other lofty goals and personal dreams. In this staging area I met a 70 years young man named Phil Pearce who had run the Boston 26 times. I just wanted to take a picture which he obliged and I sent it immediately to The Dougster. Phil is president of his running club located in Maine called the over 65 running club. I had the good fortune to sit next to him on the bus. We were also in the same corral and qualified with the same time at 4:11. He told me several stories about his Boston experiences and adviced me on the course itself. When we arrived at Hopkinton HS, we made final preparations to ready ourselves for our start time. Phil invited me to go to a relative’s home walking distance from the start line. I was truly grateful to be out of the heat and to have this opportunity to meet another New Englander. This 85 year old lady was so kind and gracious. We had a short visit and then we went to our corral. The start line is up a hill next to a korean church where the elite stay until they start according to Phil. 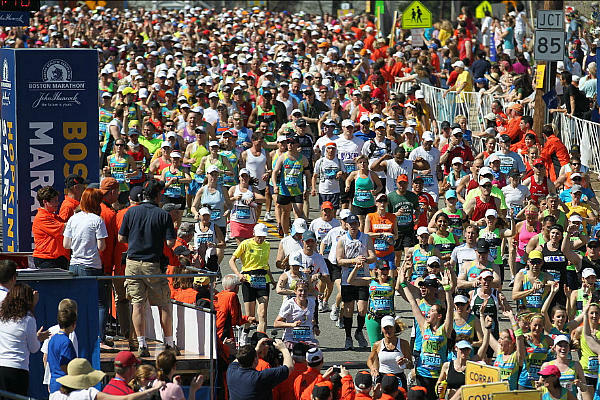 When we entered our area, it was obvious to Phil that many had deferred the race because it wasn’t crowded at all, not even as crowded as St. Louis Rock and Roll. Several all star runners came up to Phil as he point out who this runner was and that runner, all ranked New England runners according to my newly found friend. The BAA asked the runners to help one another on the course if it appeared one of us was in trouble from a medical point of view and the next thing I knew, I was crossing over the start line on my way to Boston. I tried to stay with Phil and managed for four miles but then settled in to a nice 9:15 pace and turned my attention inward to ” run my race.” I admit, I loved the downhill start! I held on to every piece of advice Phil gave about the start and tried to pull back, conserving and running slow and even. There were shady areas and I stayed to my right seeking shade wherever it could be found. As Phil described, the first 13 miles were easy compared to the second half. Everything you read about the crowds for Boston are true. The hoses were out, the oranges, ice, Ice bags, water and more water. The tunnel of love was the tunnel of love with Wellsley students screaming for a kiss. Occasionally a very sweaty guy would stop and spend a great amount of time kissing passionately one of the girls. It was hysterical and it gave all of us a lift as the temperatures continued to climb. This was only mile 12. As we passed through the half way point, I was feeling good about my pace, a bout a 9:30-9:40. People were struggling from about the 10k mark and it became more noticeable as the race progressed. The “cooling huts”, usually located near a fire station, were the greatest invention of the day…ice cold mist through a tunnel. People were standing in them. Many spectators were hosing us down but that made our shoes very wet. I was surprised I did not have blisters. The soles of my feet felt like they were on fire from about mile 7. Those elite runners just burnt up the course apparently! I walked through almost every water station, ate a lot of oranges, a few banana pieces, pretzel pieces, a chocolate kiss, an Oreo, 3 advils, a small cup of ice cold beer ( I just couldn’t resist), diluted Gatorade and water of course. I ran most of the race with a group that became familiar after a few miles. There were charity runners, students, a couple from Denmark, athena clad yogis and vegan natural runners according to their outfits. We didn’t talk much trying to conserve energy but looked after one another. One guy gave me an ice bag that I put behind my neck held by my very wet bandana. It stayed with me for several miles surprisingly and very helpful. My family greeting me just about mile 20/21. That’s where I was sipping that ice cold beer and my son reminded me that I was never going to “win” with poor choices like that! That cracked me up. I stopped a few minutes to be with them and so grateful to see them. This was also the start of Heartbreak Hill, the final hill of the Newton Hills. There are four hills but I swear there were more than that! And Newton, the rich and famous live in Newton which was obvious by the beautiful homes there. Great events/ parties goin on too. After all, no school, no work, it was a state holiday, Patriots Day. My goal was to run Heartbreak Hill and I did that. Then the next mile, 22, the backside of Heartbreak Hill, which is known as ” the haunted mile” was a welcomed downhill grade. Haunted mile is named for a cemetery we pass during this mile in the course just before Boston College. Unfortunately, something very serious happened here. A runner was staggering about 20 feet ahead then collapsed as we caught up to her. The runner next to me caught her and I stopped. She had a seizure and then went completely limp. The runner who caught her, took a pulse, told me to get help and ice. I said a prayer to save her as I ran to some spectators, got ice, they called an ambulance. Took the ice to the scene, took instruction from the other runner who was in full control of the situation who then told me to run to a red cross station for help. Red cross also called an ambulance, they could not leave because they had a full station of runners needing help. I ran back to the scene. The runner was breathing and semi conscious. The runner who caught her turned out to be an anesthesiologist and continued to monitor her until the ambulance arrived 15 minutes later. A spectator nurse was also there to assist by then. I walked away, overcome with emotion. It took a while, quarter mile maybe, and then I started to feel some good energy again from those incredible Boston College students who embraced me, encouraged me and pushed me through to the famous Boston landmark, the Citco sign by Fenway Park. I used Galloway method of run 4 minutes/ walk 1 minute until mile 25. I also used the crowd by going to the side lines, thanked them for a great experience and lots of high fives. That helped to pull me through the human carnage those last few miles.Then I ran it in. Thanks for tracking me. And most of all, thank you for helping me raise nearly $1200 for The Sammy Fund, for our disadvantaged youth right here in our community. You were my rock when the going got tough. There were some great moments. I am honored to have experienced a marathon like no other on our planet. In a previous post, I introduced you to Ultra-Runner Jared Busen. Jared completed a 150-mile race this May, and he wrote a wonderful breakdown of the run to share with my readers. For more race recaps, gear reviews, photos, and videos from Jared, please visit his website:www.runhappens.com. Jared is currently training for the Badgerland 24-Hour Track Ultra-Marathon and hopes to complete 130-plus miles. He is running this race in support of the Wounded Warrior Project and has set a goal of raising $5,000 to support our military heroes. Please consider making a donation — either a one-time amount or by-the-mile — for this honorable cause. Visit http://tinyurl.com/WWPJaredBusen to make a donation or for more information. May 6, 2011, was my 150-mile run. I enjoyed it immensely. I finished first overall, struggled at some points but dealt with it all as it came and kept knocking the miles down. Official time is 50h09m54s. The trail is a 10-mile loop repeated 15 times with 2,400 feet of elevation change per loop. This means that running 150 miles gets you 36,000 feet of elevation change. The trail is set up for mountain biking and is a mixture of old logging roads, single track, switchbacks, massive ascends and descends and everything else you want a trail to have. Without a doubt, the toughest course I have ever run on. There was an aid station at the 0/10 or Start/Finish as well as one at the 5.5-mile mark where crew could meet up with you. My brother volunteered to come out and crew for this race. He met me each time I hit 5.5 or finished a loop out. We had already discussed nutrition, what I’ll need each time we see each other before the race even started as well as what I’d like next time I see him during the race. He did an amazing job as crew and I had no issues, things went smoothly with him. Below I’ll try my best to recount what each loop was like as well as give my official split (h:mm). This was the first loop, and it was used to figure the trail out. I learned fast thanks to several steep and long climbs as well as descends that my quads will fall off if I run each of them. I ran some of the hills as well as some of the really technical sections of the trail on this loop, that I never did again. This was my fastest loop and I should have backed off more. Nothing special on this loop. Just backed of a bit, but not enough, and knocked out one more loop. Again, tried to slow the pace down knowing I was going too fast. I had a hard time backing off cause I really was running very easy. Big thing here was that at mile 25.5 (aid station) I took the first position. I didn’t want this that early in the run, but it happened so I took it and hoped the pressure of keeping it didn’t get to me. At the end of this loop, my buddy Darrin caught up to me who I hadn’t seen since last September at the 24-hour track run. Darrin was there as part of the 100-mile crew. Which means that he was officially in the 100-mile race but not competing. His job was to pace for Ryan Dexter, another friend of mine. Ryan is the type of ultra runner I hope to become someday but probably never will. During the course of the weekend, Darrin had to get a total of 100-miles in so it would count as a finish. He got some in on Thursday, some on Friday and the rest on Saturday. Darrin was kind enough to run a loop with me here. Darrin decided to hang with me again, he helped me pull around and finish one-third of my race. Fifty miles knocked out in just 11 hours; that was too fast and I ended up paying for this later. Darin ran with me again on this loop until about mile 56, then he took off to finish the loop out quicker then I was going to. He needed to pace Ryan on his next loop, and Ryan was still knocking out low 2-hour splits so Darrin wanted some rest. This loop was to be my last one finished in daylight on Friday. The plan was during the night — when the running is so much slower because you just can’t see the trail as well — to run two to three easy laps during the night. The intent was to recover and go easy ’til the sun came up then go back at it a little quicker. I had started to hit a wall already so I was happy to have the easy running for a while. Justin decided to join me for this loop. It was his first time running with a headlamp, seemed like he enjoyed it. Also his first time seeing the course; too bad it was at night, so he didn’t get to see it. I was still up against a wall and was beating my head against it to break through. Justin went out again on this loop. The sun was just coming up so we started with the headlamps but turned them off within a mile or so. The first few miles of this I kept falling asleep while I was running. This was new to me — didn’t want it to be happening, but it was. I was really struggling at this point. But we made it around and still knocked out some miles. I ran solo for this loop. I was still in the lead and had gained a lot by running all night. The other 150ers had gotten in some sleep in the night. I kept racking up miles while they laid there. Now, they were up and they all passed me, were looking great and I was struggling just to walk. I realized that I can’t break through this wall I’ve been fighting with the past 30-plus miles. At mile 95.5, I told Justin to talk to the Race Director and find me a place to sleep for a bit. Miles 98-100, I started to hallucinate. I kept seeing people behind the trees peeking out and staring at me. One guy would peak out, take a picture and duck back behind the tree. Another was a married couple and the husband would peak out one side of the tree, the wife the other. I knew that they weren’t real, but I was out of it enough that I still stopped over and over trying to get a better look at them. I finally made it in and finished 100 miles in about 30 hours. Got an hour and a half nap here which is why the above split is so long. Justin woke me up and got me going. Ryan’s crew chief knew me and came over with Justin to give me a heart-to-heart on digging down and seeing what you are made of. It’s all stuff I know, but is always good to hear. Justin had set up a pacer for me, Mindy. I already knew her from Ryan’s crew and she had crewed for me in the past back when I first met Ryan and his crew. She ran this lap with me, and I think the run time was in the low 3 hours. The nap helped a ton, and I felt like a new man. I was running strong again. Justin ran this one with me, giving him 30 miles so far where before his longest run was a marathon. This lap went well, and we were both excited there were only 30 miles left in the race. We decided I’d take a 45-minute nap, when we made it back to the start finish, with the hope of knocking out the last 30 in one shot. The nap is included in this so the split is long. After another quick nap, I was running good again and knocking out the miles pretty easy. The sun had gone down at the start of this lap, so it was back to headlamp running. Jared crosses a creek on the trail. Justin hooked me up with another pacer for this lap. Brian was there as a volunteer and was kind enough to go out with me. We wanted someone to knock out a lap with me, keep the pace up if possible and just get more miles in. At about 137, I hit the wall hard. I had slowed down and was struggling to run. It was so frustrating to be about a half marathon out and start to hurt again. I wanted to fall asleep so bad, I kept fighting it and never did but I wanted to. At mile 139, I had another hallucination. This time, I saw a cowboy leaning against a tree on my side, not peeking out behind. He looked at me, tipped his hat and gave an odd smile. He scared me and I really don’t know why. It was still night so I should not have seen detail but I was able to. Again, I knew it was a hallucination, but I was out of it enough that it felt real. Since I had a hallucination I went down for about a 30-minute nap before going out on the last loop. I was a few hours up on the second place guy so I took advantage of that and slept for a bit. Justin woke me and we started moving. I was really stiff to begin with, and it took a few miles to limber up. A few miles from the finish, I knew I was going to make it and could smell the finish line. I started to run more and more, and run faster and faster. The last two miles was all running, up hill, down hill, whatever I attacked it. Justin kept cheering me on and running with me. I’ve run so many miles in my life that my body doesn’t need to be told what to do. I ignored the previous 148 miles of running and just took off. We had a beautiful all out sprint to the finish. Bringing home first place in a time of 50:09:54. Luckily Ryan Dexter happened to be at the finish line (after CRUSHING the 200-mile race) and was able to see me finish. I had caught his finish the night before, but since I was still in my race, I had to keep moving and didn’t have a chance to talk. I was able to shoot the breeze with him for a bit before he headed home. Justin and I made it over to a local B&B, had showers, a huge breakfast and a 7-hour nap. This was a hard race, and it broke me off at one point. However, both Justin and I reacted correctly and dealt with it instead of giving up or wishing for something different. I have already signed up for this race in 2012. I can’t wait to go back. Now that I’ve done it, I know how to train so I can rock a good time next year. Thanks to Justin for his phenomenal support, I was able to cover the distance. Big props to Ryan Dexter’s crew for throwing us a lot of support as well. The ultra running community is amazing cause everyone takes care of each other.